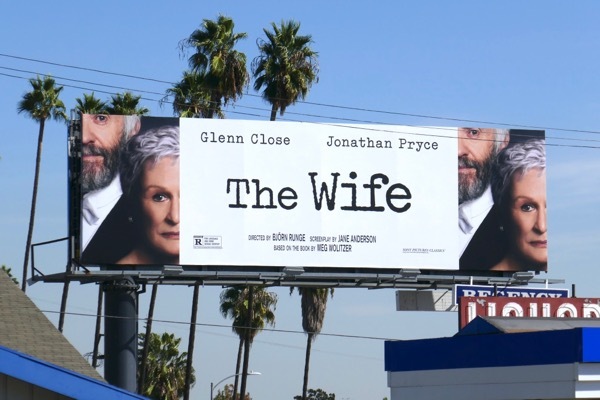 Congratulations to Glenn Close for another Golden Globe nomination (her thirteenth to date), this time for her starring role in The Wife movie. 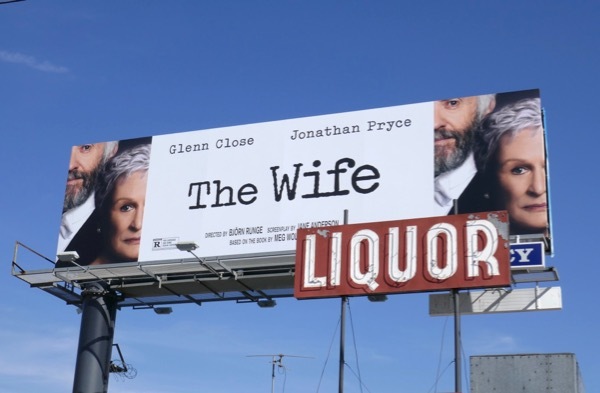 In the film based on the 2003 book of the same name by Meg Wolitzer, the six time Oscar nominee plays 'Joan Castleman', the perfect devoted spouse who has sacrificed her talent, dreams and ambitions for her husband. 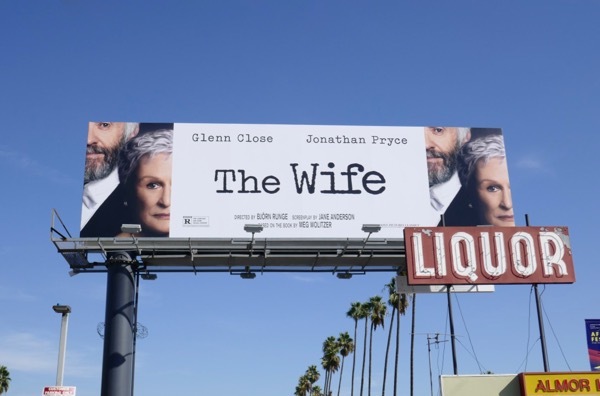 On her way to Stockholm with her narcissistic husband of four decades (played by Jonathan Pryce) to collect the Nobel Prize for Literature, she begins to question her life choices including her husband's many adulterous affairs and the way tells everyone, my wife "does not write". 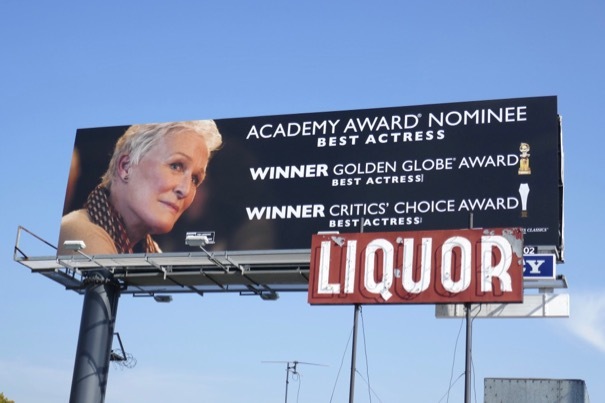 This consideration billboard for the motion picture was photographed along Sunset Boulevard at Fairfax Avenue on November 1, 2018 (the movie itself was released in the U.S. mid-August). 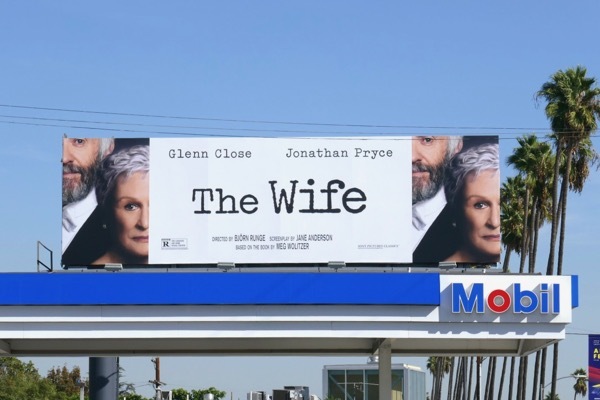 Fans of Glenn Close can also enjoy these Damages TV series billboards from 2010 and 2011. Let's see if director Björn Runge's film and her acclaimed performance can land the actress her third Golden Globe win and maybe her first Academy Award. 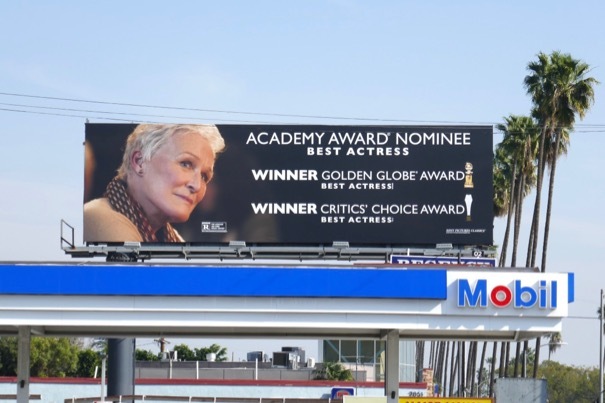 UPDATED: Congratulations to Glenn Close for her Golden Globe, shared Critics' Choice Award (with Lady Gaga) and Screen Actors Guild Award for Best Actress.